BorgWarner (NYSE:BWA) is a key supplier to the auto industry, selling systems and parts for automotive powertrains to companies such as Ford (NYSE:F). The auto sector has been doing pretty well of late, with 2015 U.S. auto sales hitting record levels and global sales expected to increase over 2014, even if the pace of growth is slowing. That's positive for BorgWarner but highlights some potential risks. Even if you like the company's prospects, here are a few reasons BorgWarner's stock could fall further than it already has. The most obvious risk to BorgWarner's business is a decline in auto sales. The company is focused on the industry, and to a large extent, its results ebb and flow with its customers' production. That's not something to take lightly. For example, Cummins (NYSE:CMI) is a large diesel engine manufacturer. It sells to a variety of original equipment makers, but a key market is heavy industry. With end markets like mining in the doldrums, Cummins' top line fell 6% in 2015. Worse, the company is projecting a 2016 revenue decline of between 5% and 9%. Although some of what ails Cummins is related to a strong U.S. dollar, weak end markets were the real trouble spot -- which brings us back to BorgWarner and its auto focus. Sure, the auto sector has been doing well, but if there's a downturn in auto sales, look for investors to shift out of BorgWarner even more aggressively. Longer term, there's another issue that BorgWarner has to think about -- its competitive position. Although the company has solid relationships throughout the auto industry and getting parts into a car model generally leads to a high degree of recurring revenue, the auto industry is notoriously cost conscious. Automakers are always looking to pinch a penny. And there are plenty of companies that would be happy to take BorgWarner's place if it isn't willing to work with the automakers. Then there are the costs BorgWarner faces for the commodities and products it uses. Although commodity costs are historically low today, if they should head swiftly higher the parts maker would face material business headwinds. While that may not hit its top line, it could very well crimp results on the bottom line. In the end, BorgWarner has to run lean and mean -- it has no choice in a highly competitive industry. If something should get in the way of its ability to do so, look for financial results, and the shares, to head lower. Another risk to think about is BorgWarner's global exposure. Over 70% of its business is derived from outside the United States. That has a number of implications. One that's center stage today is the impact of currency fluctuations. To give you an idea of the impact, the company's third-quarter GAAP revenues were down 7%, but if you pull out the impact of currency changes, they were up 3%. So you'll want to keep an eye on this ongoing issue today. It can make underlying trends hard to read. But there's more you need to be concerned about. For example, you may be able to get a feel for the U.S. economy because you live in it, but that's just one relatively small piece of BorgWarner's business. Other key markets include China, where growth is slowing down, and Europe, where many countries are facing economic headwinds. If any of these markets should tip into a tailspin, which may not affect your life directly, it could hurt BorgWarner. In other words, global growth is the big issue here, and bad news out of any key region could lead investors to sell first and ask questions later. Yes, that's related to auto sales, but the impact on BorgWarner's shares is likely to show up before its orders start to slow. Another risk to think about today is customer specific. One of BorgWarner's largest partners is Volkswagen, a company that accounted for 17% of sales in 2014 (Ford was a few percentage points behind in the number two slot). With this particular automaker in the regulatory cross hairs right now for skating emissions standards, BorgWarner could see a bigger hit to results than overall auto sales might predict if customers decide to avoid a tainted brand and large BorgWarner customer. However, this one could cut the other way, too. Since the products BorgWarner sells could help solve VW's emissions problems, VW's total car sales might decline, but BorgWarner might find it gets more of its products in the Volkswagen cars that are sold. Regardless of how this customer specific issue falls out, you should keep a close eye on VW right now. 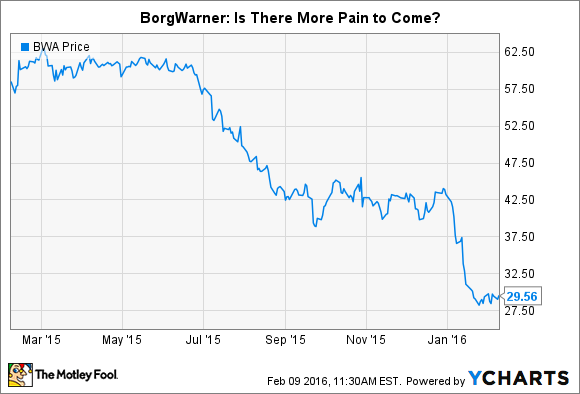 BorgWarner shares have already felt the sting of investor selling. With the shares down roughly 50% since the middle of 2015 you might be tempted to jump aboard. In fact, there are plenty of reasons to like the company's long-term prospects, particularly its ability to help automakers meet environmental regulations. However, you shouldn't lose sight of the risks. A focus on one industry, a constant need to keep costs in check, and a largely foreign business are three that could derail financial performance and cause BorgWarner's stock to fall further than it already has. Volkswagen, meanwhile, is kind of a wild card right now. You'll want to keep these risks in mind if you're doing a deep dive here.